After alternating the colors of glass, the stripes have then been raked in a way that adds great raised texture and visual interest that results in a shape that will make a wonderful focal for a Jewelry and decoration. 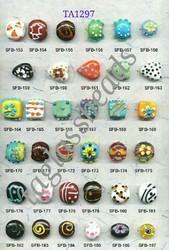 We are Manufacturer and supplier of Dotted Fancy Beads. These dotted fancy beads are high quality handmade lamp worked glass beads. Available in many colors. The presence of these double color beads creates a magic that bedazzles and entices the senses. Aesthetically designed dotted beads beautifies the look of apparels. Our range of dotted beads is vary popular among our clients for it unique appeal. Brilliant designs can be created using dotted beads efficiently. 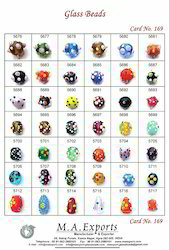 Our designers are expert in making customized dot beads.